It’s been a busy month in mortgages, as the industry appears to be making up for lost time over the holidays. 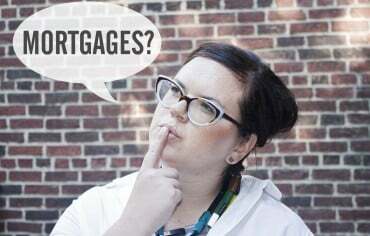 Four of the five Big Banks in Canada made headlines by lowering their mortgage rates 10-20 basis points, and we saw a corresponding 10 basis point drop in the best 5-year fixed mortgage rates on our site, from 3.24% to 3.14%, offered by Ontario mortgage brokerage Tridac Corporation Ltd. – The Mortgage Centre. Meanwhile, housing continues to flourish and defy expectations; combined with favourable mortgage rates, it should make for a busy spring market. Without further ado, here is the mortgage news that made headlines this month. From 3.79% to 3.69%, RBC dropped its 5-year fixed mortgage rate by 10 basis points on January 20th, and Scotiabank, BMO and TD quickly followed suit. 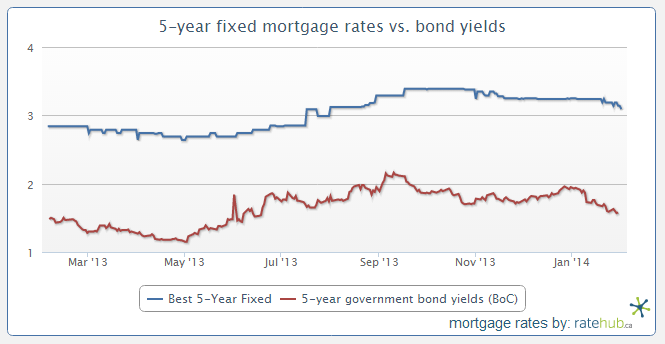 As notable as these changes seemed to be, the best 5-year mortgage rate in Canada can be found for 3.14% on our site. The drop in mortgage rates can largely be attributed to a drop in bond yields, which fixed mortgage rates follow with a strong correlation and are a proxy for the cost of funding mortgages. You can see in the chart below (constructed with Ratehub.ca’s interactive historical mortgage rates chart-builder found here) that 5-year bond yields fell to 1.58% on January 30th, from a high of 1.96% in December 2013. The best 5-year mortgage rates on Ratehub.ca have hovered near 3.09%-3.19% in the past week – a drop not seen since August 2013. 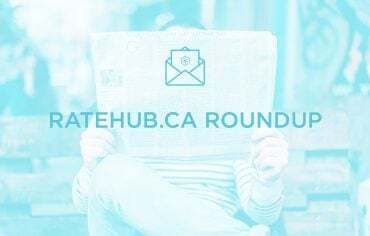 As a growing mortgage authority in Canada, Ratehub.ca CEO Alyssa Richard was called on by the media – including The Globe and Mail, Toronto Star and CTV News – numerous times this month to comment on the market. Watch her on CTV News below, and visit our Press Centre to see all our media mentions and appearances. In December, the average Canadian house price soared to $389,119 (according to the CREA) – up 10% from the same time in 2012. Sales, on the other hand, were only up 0.8%, reflecting abnormally low sales activity in Toronto and Vancouver. Real estate agency Royal LePage is expecting a strong market into spring, as reported by Tara Perkins in The Globe and Mail. This sparked some debate around affordability, with the IMF declaring Canada as the most expensive place in the world to own a home compared to renting. Moreover, Rob Carrick questioned the sustainability of housing price gains over the next ten years, compared to household income growth. It’s interesting food for thought. I noticed a string of articles this month around mortgage insurance companies and lenders refusing to finance certain properties and areas. Not surprisingly, lenders are wary of flood-prone areas in Calgary, with homebuyers facing insurmountable purchase conditions and sellers struggling to offload their properties. Our friend Don Campbell of the Real Estate Investment Network (REIN) offered this advice to buyers: Check with your bank and insurance company before choosing a neighbourhood; this has helped some buyers avoid disappointment. Meanwhile in Toronto, a couple articles on lender “flagged” properties caught my attention. The first follows an argument by Brad Lamb that lenders are missing an opportunity with “micro condos” (sub-400 square foot units) they are refusing to finance, while the other stems from refusal by mortgage insurance companies. A Toronto mortgage broker saw a deal fall through in the 11th hour on a unit in the Printing Factory Lofts in Leslieville, due to an arguably ill-advised move by the condo corporation. It seems as though a collective list of flagged properties and areas would well-serve the industry. 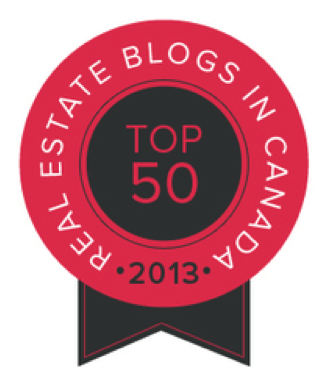 We’re proud to announce our recent inclusion as a Top Canadian Real Estate Blog, and offer our congratulations to the other winners. We’re in good company! You may have noticed we now are featuring author bios at the bottom of our blog posts! Our hope is the bios will help you learn more about our site’s contributors, as well as discover more of their content. Head over to our Facebook page to participate in our fun “Price is Right”-themed real estate series, which asks you to guess the sale price of some recently sold homes in the Greater Toronto Area. Don’t forget to sign up for our new monthly newsletter, which combines all our best content and a mortgage rate update in one monthly bulletin. Subscribe here.